So they say, “The bigger the wheel, the longer the spoke, the bigger the tire.” Yawn. You are a leader, people follow you, but they also think you’re boring. The majority just don’t like to hear you speak, or think, they just flat out don’t like you. So once you begin talking to all these different attitudes of people and various platforms, what you need to do is effectively get your message across so that each and every one of them will at least hear you. The key for these speakers, who usually speak to mass audiences, and how effective they are in getting their point across, is about connecting to them emotionally. So there you are, sweating your brow, making that important “talk” in front of that anxious, annoyed, and tired crowd. You’re wondering how you can connect with them, will they listen to you, how can you get your primary message out. You may think that the solution is easy. Your plan is to just read your script, relay your thoughts by stating a bunch of facts and statistics, and you want to do so as quickly as possible. Then your plan is to get the heck out of there, exit stage left. This, however, isn’t the path that you should be taking. All of the facts and stats on a chart may tell the true state of affairs, but to genuinely connect with them, and to make these facts stick, you’ll need to read your audience to gauge what their exact mood is. 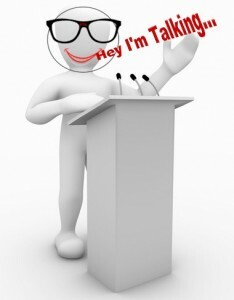 What you need to do is go beyond the simple and straightforward talk that you present at the podium. The key to getting these people to listen to you is so that they’ll remember what you said, forcing them to take the desired action. To do this, you’ll need to reach them on an emotional level. Going back to you the leader, realize that your audience doesn’t think that they like you. They may be apprehensive, suspicious, or skeptical. So what you have to do is make your audience feel and experience whatever you’re communicating. People are always desperately wanting to connect with each other, and the only way to do so is by feeling, getting emotional, and not by logic or math. This is because humans are able to experience empathy with someone’s “story or message,” as if it were their own. So raising the emotional level is the key to motivating others to think and then act on how you want them to. There are effective strategies which are proven to work to emotionally connect with anyone who’s listening to you. Are you known to be someone who walks into an empty room and blends right in, or do you silence the crowd the moment you make your entrance. Regardless, it’s important that you make your presence known before you speak. So never say anything until your audience knows that you’re there, and you make that connection. At times, a first impression is often cured by a second look. So if you’re the speaker and standing in front of a large crowd, a boardroom, or even a single individual, you need to be in command. You will effectively grab this command by how you initially carry yourself, this before you speak. It depends on your body language and the positive aura that you project. When you’re doing so, never allow them to see you flinch or sweat, avoid looking down, avoid rapid eye movement, don’t get nervous, or fidget, just breathe. Once you get their attention, then force them to look up at you before you speak. Make them take notice with your smile and quiet confidence, inviting them to pay attention. Engage them on an emotional level by offering a warm open greeting. People will generally remember the first thing that you say which has any impact or substance. Once you grab their attention by doing so, then jump into the heart of your message of what you have to say. So a powerful entrance and a jaw dropping awesome inspired opening will usually stick like velcro with your audience, which creates the emotional impact that you’re looking for. Use verbal signals which are attention grabbers when you move from one subject or portion of your speech to another. For example, you might just number all of you key points, or use other verbal cues such as, “Let’s move on to the next point” or “So the next topic is…” Always make sure that you give your audience notice so they’ll pause and look at you. Take all of the important points from your speech and then organize them them at the end of your presentation. Keep them interested, alert, and remind them again by saying, “So to summarize,” and then completely recap everything that’s important from your presentation which matters the most. What your audience needs to do is they’re able to emotionally feel and then experience what you communicate. If you fail to do so, you won’t have their full attention, or the impact that you want to achieve.